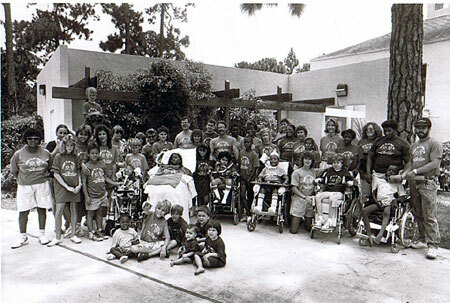 In 1986, the first Ventilation Assisted Children's Center Camp took place during the summer and operated in collaboration with SKIP of Florida. The first camp was known as SKIP Family Learning Retreats. Carol Montiel, RN was actively involved in the creation of the camp and participated every year thereafter until the year 2002. Barbara Donahue, ARNP and the parents of two of Dr. Simpser's patients were also involved in the camp start-up. When the local SKIP chapter dissolved, Dr. Simpser elected to continue camp as offshoot of Nicklaus Children's Hospital Ventilation Assisted Children's Center (VACC Camp). View annual group pictures taken thoughout the years. Click to enlarge.